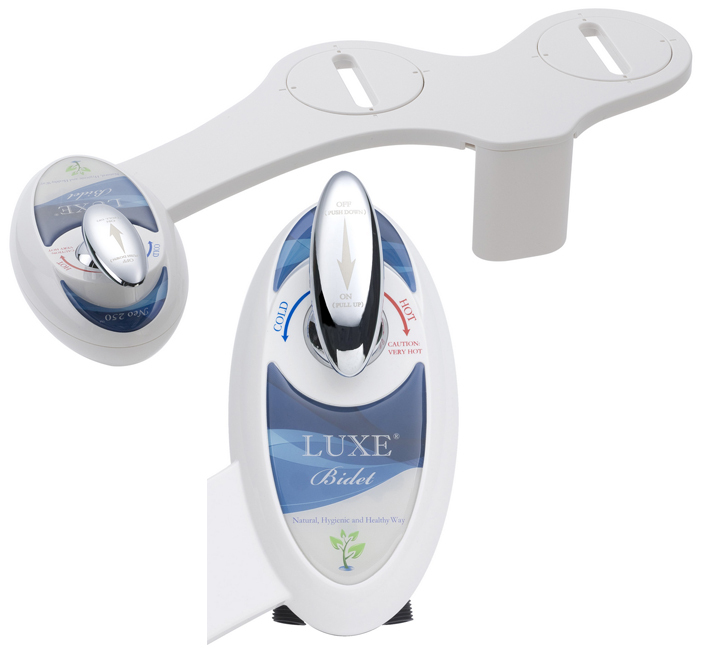 Luxe Bidet offers a bewildering variety of bidet attachment models from which to choose. Not to worry! Let us cut through the complexity, simplify the choices, and arrive at an easy way to pick the best one for you. 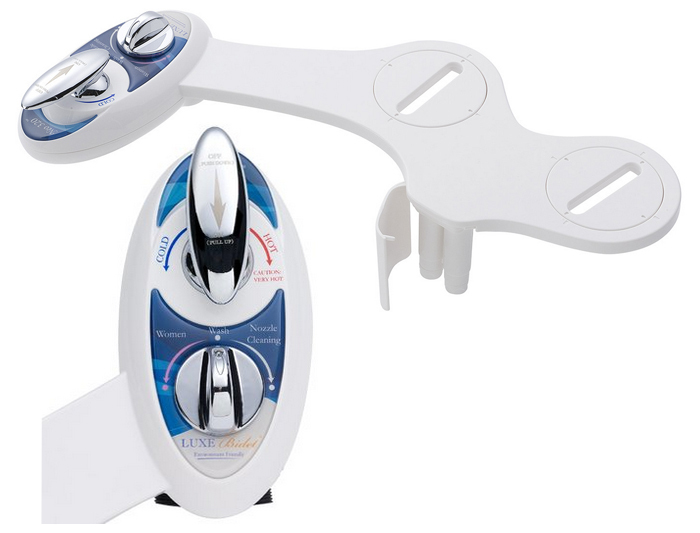 In this post I’ll cover – as of this writing – the 7 bidet attachment models from Luxe Bidet: MB110, Neo 110, Neo 120, Neo 180, Neo 185, Neo 250, and Neo 320. See, the list already seems overwhelming. Stay tuned and you’ll see how quickly we whittle it down to arrive at a final selection. From the entry-level MB110 to the high-end Neo 320, these appliances are known in the trade as “attachments”. That means they are not full stand-alone bidets and don’t even replace your existing toilet seat. They attach underneath it, hence the name. Want to learn more about bidet attachments? Read our definitive guide here. As a result, they lack some of the features that bidet buyers often want – such as a heated seat, or a warm air dryer, a deodorizer or individual preferences retention, to cite just some examples. On the other hand, an attachment is the ultimate in simplicity in installation and use. Also, you generally save a lot of money with these simpler devices. So, with that intro done, let’s take a look into the details. In a hurry? No time to read the nitty-gritty? 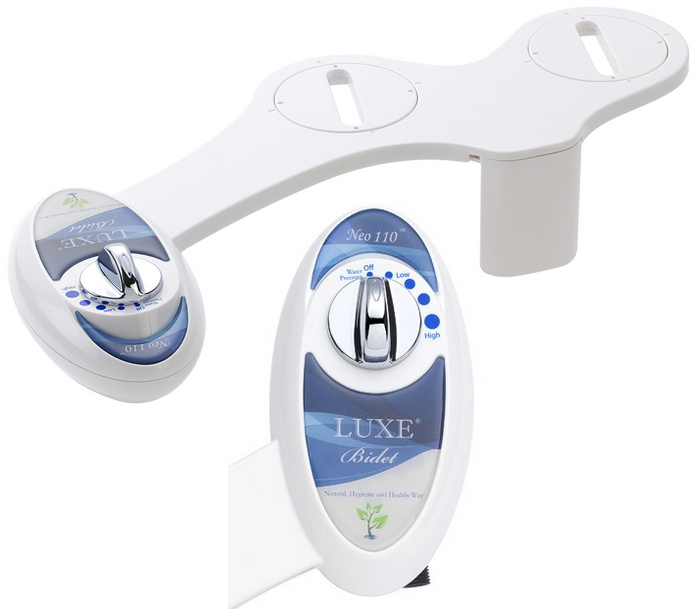 In the table below I tried to summarize and compare the most important features for the Luxe Bidet attachments. Read here my recommendation. 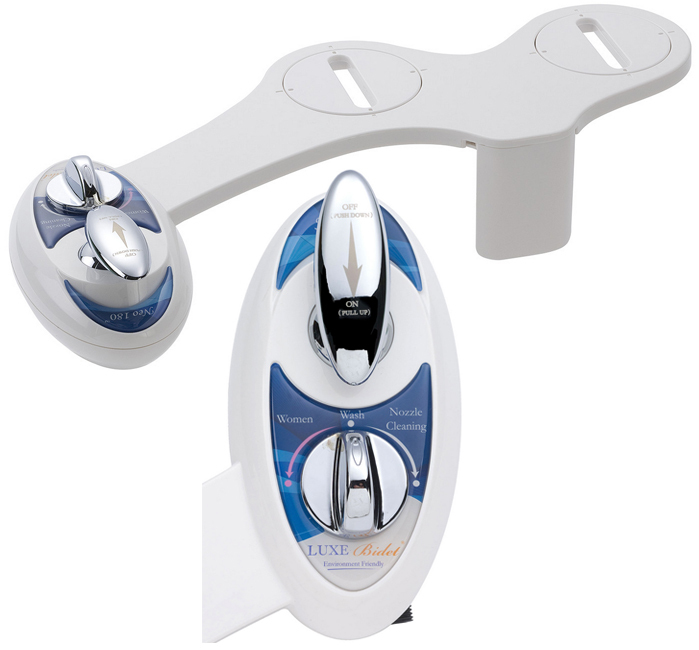 The MB110 is Luxe Bidet’s entry-level model. Not surprisingly, it offers the fewest features, but it performs the basic functions well enough. It is made exclusively of plastic, but the plastic parts are fairly sturdy. The pressure is adjustable via an easy-turn dial right near your right hand. However, because this model offers a cold-water connection only, the temperature is not. 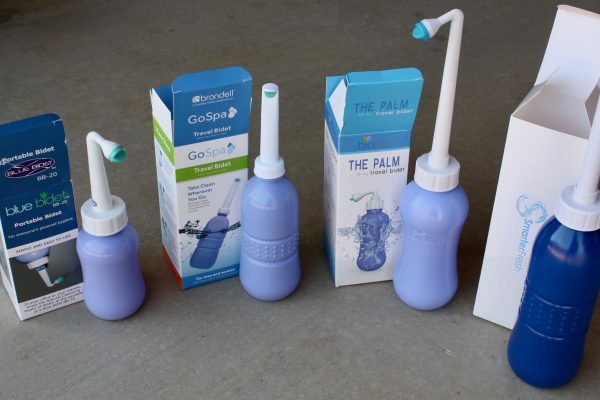 What comes out of the cold-water home supply is what touches your skin. The MB110 has a retractable nozzle, which keeps it out of the way when not in use and helps keep it cleaner. The unit comes with a 1-year warranty. One of the best upsides with this model is you have to spend only about $30 – as of this writing – to get a bidet that installs in minutes and provides all the basic cleansing features. The Neo 110 is the next step up and it shows. The design is more attractive and this model introduces several new features. 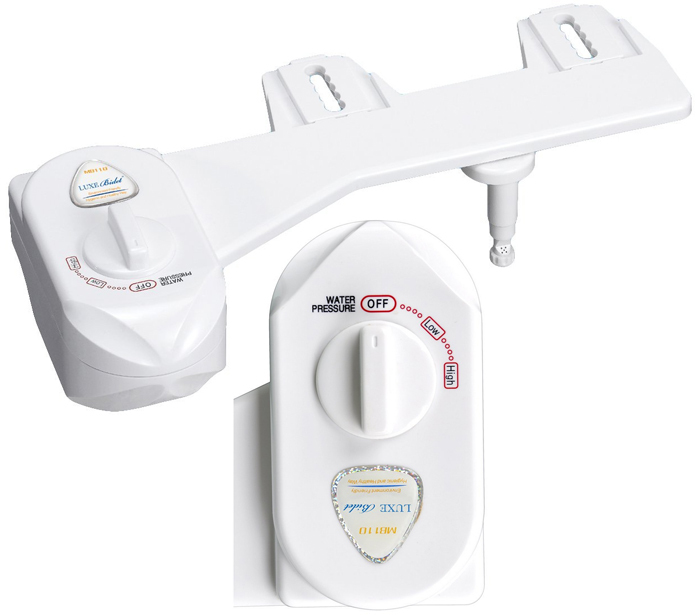 It installs just as easily – you just detach your toilet seat, place the bidet attachment, replace the seat and retainer nuts, and connect the water line. Unlike the MB110, however, the Neo 110 uses a metal braided hose, and its valves have a metal/ceramic core, just like your bathroom faucet. In addition to better materials for some key parts, there’s a nozzle guard gate to keep the nozzle more sanitary. The controls are more attractive, though they feature about the same level of simplicity. You have a dial (this time, chrome plated) that lets you set any of four pressure levels. At 18 months, the warranty is better, too. Equally pleasant, and quite surprising, the regular price (and the discounted price) on Amazon is about the same (or sometimes even less) than that of the MB110. The next step up is the Neo 120. Again that step up is a real boost. This model offers all the foregoing features of the Neo 110 but adds a second dial to allow you to select a posterior wash or nozzle cleaning. The unit sprays water over the wand tip after use (at your command), in order to lessen the need to do so manually. There may still be times you want to spray with a little bleach-based cleanser and give a short scrub with an old toothbrush, but this will make those times much less frequent. The installation process is the same, the warranty is still 18 months, and the price is a bare few dollars more than the Neo 110. Life is looking better every minute. Once again, as we increase the model number we see a corresponding increase in function. Sadly, that’s not always true for bathroom products in general. Here, the Neo 180 – available in a blue version and white version – is much like the Neo 120 but doubles the number of nozzles. That second nozzle provides for a feminine wash feature, in addition to the usual posterior cleansing option. Both retract when not in use. There’s about a $10 jump in the price above the Neo 120, but that one feature alone will more than justify the increase for a large percentage of buyers. The self-cleaning ability is extended to both wands/nozzles. There’s still a moveable nozzle gate to amplify hygiene and make maintenance easier. There is the same high quality steel-braid connection hose. However, the pressure dial has been reworked here to be even easier to operate. The Neo 180 and Neo 185 are the same unit. 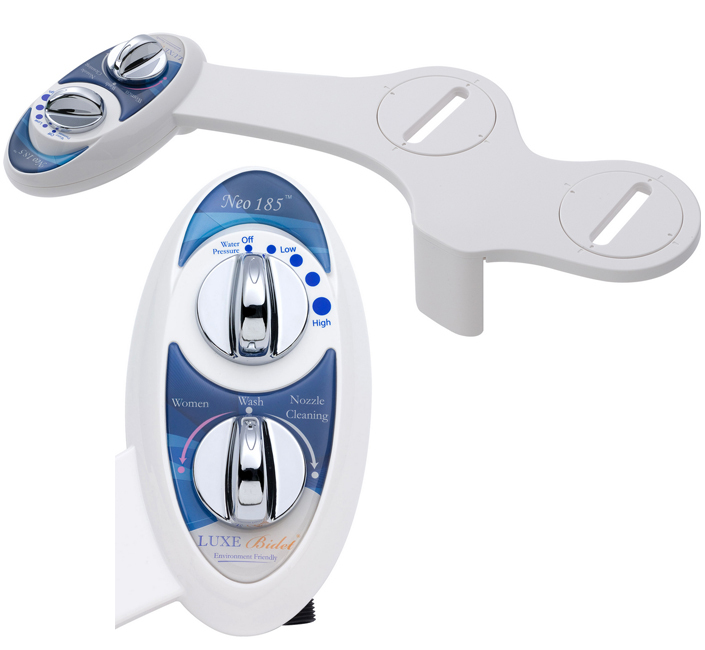 The only difference is that the Neo 185 has a large dial for the pressure adjustment control, while the Neo 180’s uses a moveable lever to adjust the water pressure. 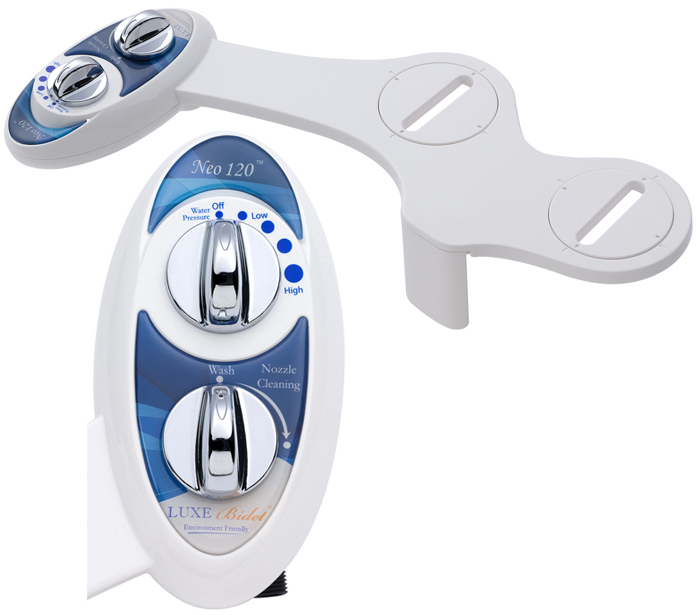 The lever on the Neo 180 is lifted up while the dial on the Neo 185 is turned to the right to increase water pressure to the bidet. Continuing the trend, the Neo 250 represents yet another step up in function from its cousins with lower model numbers. The big addition here is the inclusion of a hot water connection, a definite must-have for a lot of buyers, yours truly included. Here, that big oval handle we saw on the Neo 180 is used first and foremost for a temperature adjustment control. That same control is also used for pressure adjustment, as on the Neo 180. You press down, then twist. A little tricky to master at first, but not particularly stiff or difficult. Oddly, the Neo 250 takes also a couple steps backwards in terms of features. There’s no self-cleaning nozzle on the Neo 250. And, that nozzle is the only one; there’s no dual-nozzle arrangement as there is on the Neo 180/185. That makes for a really tough tradeoff – feminine wash or warm water? Not an easy choice. Fortunately, the Neo 320 resolves the dilemma introduced by the Neo 250. It houses the same hot water connection feature with the same metal/ceramic valves. Users that require a warm water bidet get both the comfort and extra cleansing ability only possible this way. The cold water connection hose is the same steel-braid as used elsewhere. But the hot water flows inside a polyurethane hose that’s durable and very flexible. Yet, it has a metal connector for a secure fit. At the same time, the Neo 320 doesn’t sacrifice functionality for women. It has the self-cleaning dual nozzle arrangement found on the Neo 180/185. So, you get the options for feminine wash and posterior cleansing. The warm water feature of the Neo 250 and the Neo 320 make these the only models I personally would even consider. The other models are fine. The materials are durable and precisely made. The controls are simple and easy to operate. The pressure is adequate or better. But in a place where winters can produce water from the tap that is uncomfortable on the hands, I’m not inclined to let it touch even more sensitive parts. The lack of a self-cleaning dual-nozzle arrangement on the Neo 250 makes the choice even easier. So, for my money, there’s really only one option: the Luxe Bidet Neo 320. If you’re on a very tight budget, you might very well find one of the lower-end models perfectly satisfactory. But even the high-end Neo 320 bidet only sells (at discount) for about $55 as of this writing. I would’ve preferred separate pressure and temperature controls. Especially when operating the bidet in the dark, even more so at night when you’re a little sleepy, it can be tricky to change one and not the other. Still, that’s a minor consideration. Overall, you get a lot for your money in the Neo 320 – and it’s really not that much money for this kind of product anyway. For an appliance that is designed to (and probably will) last for years that’s money well spent. And with more than 1200 (!) verified Amazon customers rating this attachment the maximum score you really can’t go wrong. The NEO 120 was my 2nd Bidet. It performed admirably but the plastic didn’t hold up very well due I believe to the difficulty installing the seat without causing stress on the device when it is used. I am unable to install a replacement NEO 120 because I couldn’t remove one of the 2 bolts holding the seat down. The youtube video was helpful on removing the anchor, but this couldn’t be done because the bolt is in the way and couldn’t be removed. Currently using the toilet seat with just one holding down bolt!! !